You should ensure that the test system environment matches as closely as possible the environment of the live system. If you are updating an existing production, the production on the test system should match the production on the live system before the update is applied. If you are deploying a production on a new Ensemble installation, the test system should be a new Ensemble installation. The deployment process is slightly different depending on whether or not the target system is already running a version of the production. If the target system is running an older version of the production, then the deployment file should contain only the updated components and some configuration items, and, in most cases, it should not contain the definition of the production class. If the target system does not contain the production, the deployment file should contain all production components and settings. There are some conditions where you have to explicitly stop and restart a component or the entire production. If you are using Studio or importing the classes from the Management Portal System Explorer, then you have to perform these steps manually. To export the XML for a production using the Management Portal, open the production, click Production Settings and the Actions tab and then click the Export button. 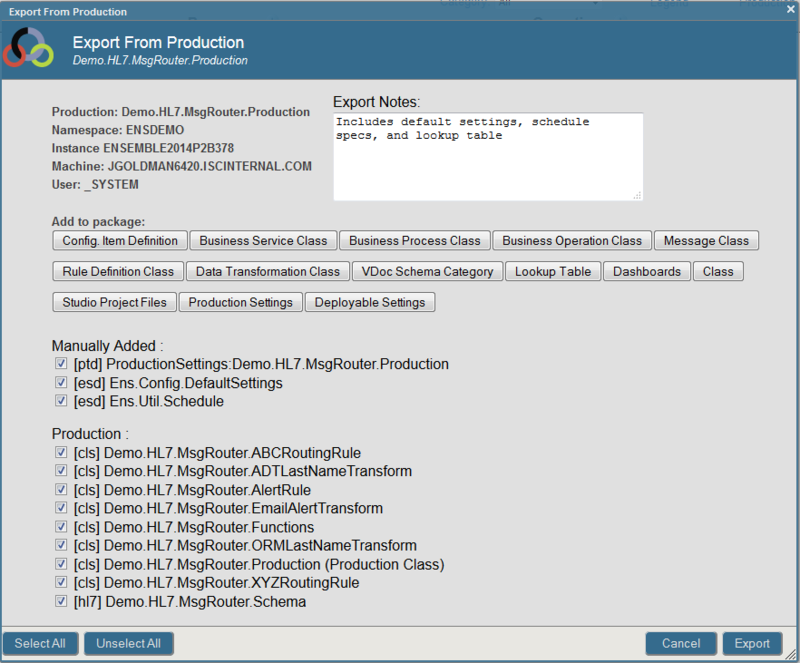 Ensemble selects all business services, business processes, business operations, and some related classes, and then displays the following form to allow you to add export notes and additional components. If you have a set of classes defined in a studio project file, you can include those classes in the deployment by clicking the Studio Project Files button and selecting the file. Once you have selected the components for the deployment package, create it by clicking Export. Ensemble selects the same components from the current production that were included in the older deployment package. Export the underlying Caché global that contains the schema and then import this on the target system. To export a global, select System Explorer > Globals, select the desired globals and then select Export. The X12 schemas are stored in the EnsEDI.Description, EnsEDI.Schema, EnsEDI.X12.Description, and EnsEDI.X12.Schema globals. The XML schemas are stored in the EnsEDI.XML.Schema global. See Exporting Globals in the Using Caché Globals guide for details on exporting globals. The Management Portal automates the process of deploying a production from a development system to a live system. This section describes what Ensemble does when you are loading a new version of a production on a live system. When you have read the deployment notes and made any changes to the deployment settings, complete the deployment by clicking the Deploy button. As part of deploying the package, Ensemble does the following to stop the production, load the new code, and then restart the production.